There are a ton of different cloud storage services out there, but there's only one that integrates fully with your Google account and that's Google Backup and Sync. 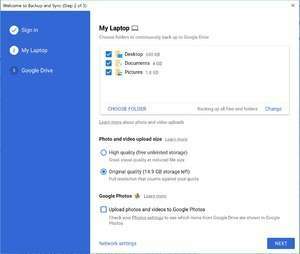 The application might sound like something new, but it's just a rejigging of the previous Google Drive service which is being phased out in favor of Google Backup and Sync. The application is very easy to use and involves just setting it up on your Windows PC and logging in with your Google account. The service automatically comes with 15GB free for private users, though it offers a number of different monthly paid options for up to 30 TB of data storage on the Google Cloud. Version 3.43.2448.9071 is a freeware program which does not have restrictions and it's free so it doesn't cost anything. For security reasons, you should also check out the Google Backup and Sync download at LO4D.com which includes virus and malware tests. Additional screenshots of this application download may be available, too.